My husband and I are fond of paneer (Indian Cottage cheese) which I use quite often at home. You will therefore find many recipes using paneer in this blog. For example, three amongst them are: Methi Paneer, Achari Paneer, and Paneer Makhmali. 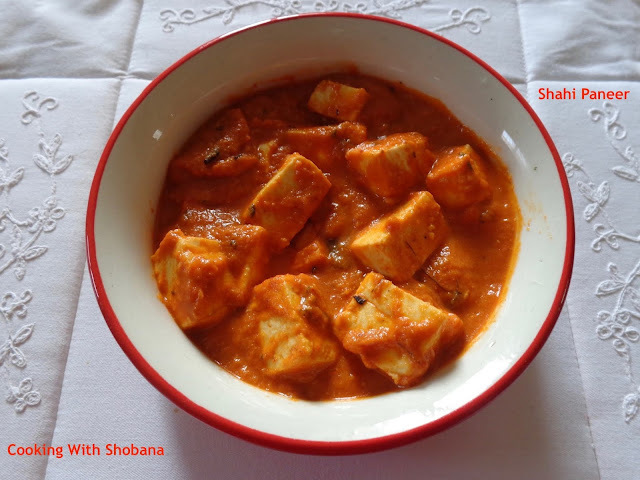 Today's recipe is adapted from Shahi Paneer by Master Chef Vikas Khanna, one of my favourite Chefs. For making the royal restaurant style dish - Shahi Paneer - we usually use a lot of butter and cream to get the richness for the dish. Today's Shahi Paneer is part of the Saffola FitFoodies range of recipes. In this more healthy version, butter and cream have been avoided without compromising too much on the taste. I have used the store bought Nilgiris Paneer and not the Low Fat Paneer mentioned in the original recipe. I have also not garnished the dish with chopped cashewnuts. We tried it out recently and it was delicious!